Design leaders and urban design exemplars from around the world offer a wealth of inspiration and instruction for climate adaptation and carbon neutrality. This fourth installment in the series of quarterly Climate Adaptation Forums, organized jointly by the Environmental Business Council and the Sustainable Solutions Lab (SSL) at UMass Boston, will focus on design on an international, regional, and local scale. Herbert Dreiseitl, the leader of Ramboll’s Living Cities Lab, will follow with a global review of inspiring design solutions for living with water – including examples from Germany, Denmark, Singapore, and the United States. He will highlight how technical innovation and aesthetic strategies are integrated to achieve exemplary climate adaptations at urban scales.To begin this Forum Jurgen Bruns-Berentelg, President and CEO of HafenCity, will discuss what is arguably the most innovative flood-protection development in Europe. 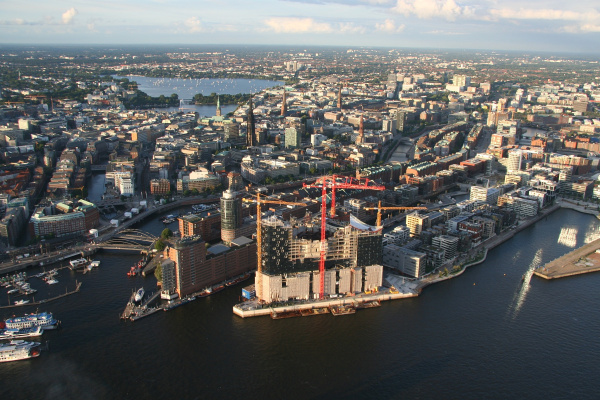 This climate adaptation development has resulted in the transformation of Hamburg, Germany’s old port into a vibrant new commercial, residential, and civic district. Through bold public investment in raised streets and infrastructure together with competitive selection used the development was able to attract massive private investment and leading architecture. After a networking break, a rapid-fire panel discussion will energize the audience. The focus will be on planning and design challenges and successes for climate adaptation projects from around New England. Alex Wilson, President, Resilient Design Institute; Founder, Building Green, Inc.
Click below to view photos from the Forum. 7:15 a.m. - 8:00 a.m.